An awesome 800m circuit with varying gradients and cambers that will be sure to test your karting skills to the max. 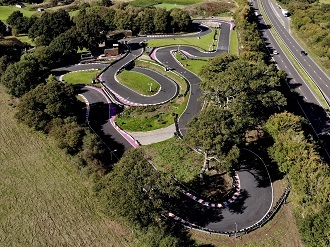 Friendly atmosphere, exceptional visibility and spectator views (the track is set in the beautiful Sussex countryside and offers views of the South Downs) and a fleet of single engine Biz pro-karts equipped with Honda GX 160 engines hitting speeds of up to 45mph all make this circuit well worth a visit! A range of other activities (including clay pigeon shooting, archery, paintball and quad biking) provide the perfect setting for a stag activity day out or hen party, and the facilities and clubhouse make this the ideal venue for a corporate event or team development day. All this and it's just a stone's throw away from the popular South Coast resort of Brighton. Head north on Old Steine/A23 toward Edward Street and continue to follow A23, keeping left at the fork. Continue to follow A23, go through two roundabouts and after 7.4 miles take the B2117 exit toward Hurstpierpoint/B2118/Albourne. Turn left onto Brighton Rd/B2117 and follow the B2117 then take the first right on to B2118 - destination will be on the right. Strictly speaking the circuit does not open for 'arrive-and-drives sessions such as this but they can be arranged by calling the office. The event is a 30-minute timed practice. Ideal event for 10+ drivers; 5-minutes practice, 10-minutes qualifying plus a 30-minute race. There are conference facilities for 30 but they have a marquee for larger events.